To my knowledge, there have been only two movies to come out in theaters this year that have to do with magic. The first one was The Incredible Burt Wonderstone. I haven't seen it yet but the word on the street is that it's a flat out "turkey" (that means that it was a horrible movie). The other magician flick, Now You See Me is pretty solid and rest assured it won't evoke you to scream "gobble gobble!" There is an original element or set up to it even though stuff is borrowed from other films. 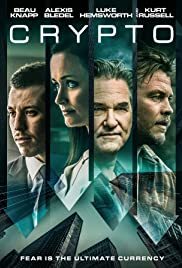 I say that because as I viewed this movie, I felt as if I was taking in Ocean's 11 meets National Treasure meets The Prestige. If you have an affection for any of the above mentioned, you'll be satisfied at what's on screen. Now I want to reiterate what I just said. Now You See Me evokes the feeling and pace of these movies, not the overall plot description. Let's just say I went in to the theater thinking that I would be confused, messed with, or kept out of the loop. To my dismay, the bulk of it was not too hard to follow and it kept me on the edge of my seat. I knew there would be a twist at the end and I was right. It's a tad implausible but the ride to get there is justified and neatly serviced. True to form, this is a piece of cinema that you'll want to see again the very minute it ends (you'll wanna view it solely to revisit everything that wasn't revealed early on). The movie doesn't make you think too hard. It just makes you think hard enough. That's why I'm recommending it. In Now You See Me, you get Jesse Eisenberg playing a deadpan version of his Social Network character, Sir Michael Caine showing up in a small role (why not, the producers figured since he was in The Prestige, that might get some more interest from the movie going public), a couple of impressive action scenes right out of The Transporter (same director so it's expected), and a car chase that'll cause you to look at the person next to you and go what the...? Anyway, I'll get your hopes a little by saying it's a good movie, but not incredibly compelling and it won't blow your mind per se. What you get from Now You See Me is a breath of fresh air, a sort of escape from all the mediocre features that have stunk up multiplexes all over the country in 2013. After viewing stuff like Gangster Squad, I as your fellow movie patron, needed reassurance and got it in a big way. Almost anything I say in relation to the proceedings will be a spoiler so I'll just lay out the players and the improbable set up which grabs you from the word "go." It begins like this: Four magicians are summoned by a higher power to team up and do elaborate shows across the country. Each of them has their own niche. Daniel Atlas (Jesse Eisenberg) is an expert with card tricks, Henley Reeves (Isla Fisher) likes to get out of glass boxes filled to the brim with piranhas, Merritt McKinney (Woody Harrelson) is out of this world with the art of mind control and/or hypnotism, and Jack Wilder (James Franco's brother Dave) is a pickpocket and escape artist. Together they form a group called "The Four Horsemen." During their first show in Las Vegas (why not, makes sense), they get an audience member to rob a bank overseas in France. They do this by teleporting him literally within seconds. When the money is clearly stolen and giving to the audience (Oprah Winfrey style), this gets the attention of a high strung detective (Mark Ruffalo as Dylan Rhodes) and an attractive French Interpol agent (Melanie Laurent as Alma Vargas). They set out to arrest the fab four with the initial help of Morgan Freeman's character, Thaddeus Bradley. Bradley is also a magician that is legendary for revealing secrets about his peer's magic (or possibly tragic) tricks. What stood out and what I embraced most about Now You See Me, is the casting. It's spot on because these actors can play these characters in their sleep. Eisenberg excels at cloying the smart aleck, fast talking narcissus, Ruffalo is always reliable as a concerned and tormented cop, Isla Fisher portrays effectively, a veritable form of window dressing as everyone's favorite eye candy, and Michael Caine has mastered the art of maintaining a strong screen presence (even if it's for 7-10 minutes of screen time). As for Freeman, he appears in pretty much everything these days so it's not worth examining. I will say this though, did he have some dental work done because his teeth are so perfect they might as well be right out of a toothpaste commercial. Anyway, there is an adequate amount of hocus pocus to admire here. There is however, a certain flaw in Now You See Me that could easily be discounted from a lot of moviegoer's minds. It's the fact that you don't really get to know "The Four Horseman." These four characters are shown escaping from the law, doing their elaborate stunts, and outsmarting everyone around them (including us, the audience). But the movie doesn't examine what makes them tick. There's also not a lot of information on where they are from and their "nothing up the sleeve" background. Their personalities aren't fully established leaving most of the attention to be diverted to the people that are in hot pursuit of their illegal schemes (Ruffalo and Laurent) and the jealous martyr who wants to profit from exposing their fanatic tricks (Freeman). Again, this is not a major oversight because the movie kind of gets away with it. All in all, this is a two hour exercise that flies by at breakneck speed. And I will say this, a lot of the surprises "The Four Horseman" pull off have to do with misdirection. Despite not getting to know them as an audience member, you just accept the fact that Harry Houdini would have been mighty proud anyway. 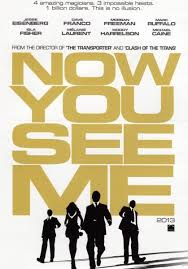 So to end this review, I'll leave you with the tag line for Now You See Me. It suggests, "look closer, because the closer you look, the less you'll see." For me, I sat ten rows back and right in the middle, my favorite seating arrangement. What I had was a good ol' fashioned time at the movies and so will you. Granted, I initially thought of this flick as an odd choice to attend as a summer blockbuster release, but with the Will Smith bomb After Earth coming out in the same weekend, it's safe to say that I stand corrected.